More than four decades ago, the 26th UN General Assembly (UNGA) declared that "the Indian Ocean, together with the air space above and the ocean floor, as a zone of peace." It also called upon the littorals and the hinterland states of the Indian Ocean, the permanent members of the Security Council and other major maritime users of the Indian Ocean to "enter into consultations to implement this declaration through universal collective security and strengthened international cooperation." These declarations have not yet metamorphosed into reality, which reflects the complexity of the Indian Ocean Region (IOR). It is also interesting to observe that the geographical limits of the Indian Ocean continue to remain diffused and unclear. 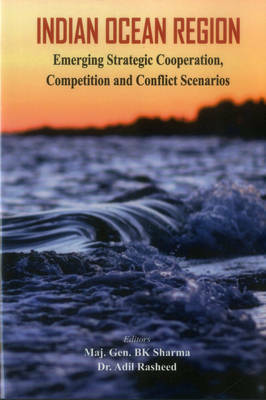 The book focuses on aspects of emerging strategic cooperation, competition and conflict scenarios; security challenges and role of major stakeholders of the region.